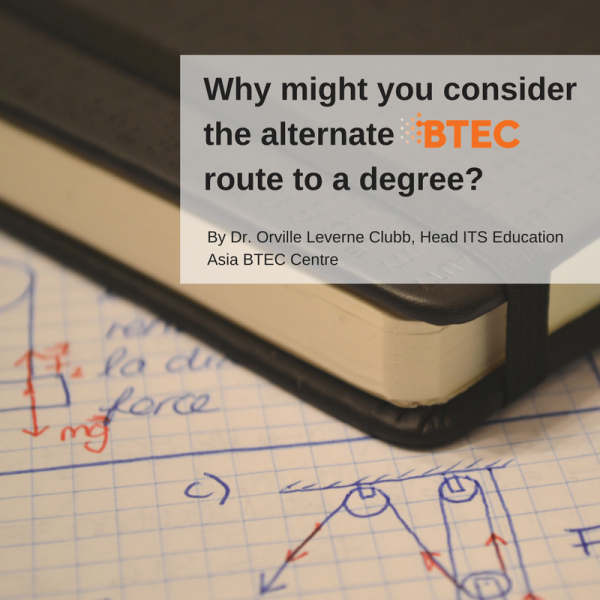 ITS Education Asia Article - Why might you consider the alternate BTEC route to a degree? Why might you consider the alternate BTEC route to a degree? When the opportunity surfaced to work with ITS Education Asia (ITS) as their Head of BTEC Centre, offering the BTEC Higher Nationals qualification(s), it was a perfect fit. Prior to taking the post, I had retired after a career of 40 years in higher education. I began to feel I needed to continue to contribute to society as an educator and welcomed the opportunity. I am a believer in non traditional paths to formal education. I am aware that there are many people who deserve a chance to advance themselves through higher education but due to many different reasons don’t have the opportunity for a traditional higher education path. I feel the BTEC HND is an excellent alternative to direct entry to a traditional university programme for a bachelors degree (or masters). In Asia, a student can achieve an internationally recognised UK awarded bachelor degree in 3 years by taking our two year full-time BTEC HND followed by a one year topping up degree. Topping up degree programmes are available either here in Asia or you can go to the UK for the topping up degree course. Basically, the BTEC HND is equal to the first two years of a British bachelors degree and the topping up degree gives the final year for the award of a bachelors degree. Depending on your goals, if you wish, in a place like Hong Kong, that means you can have an internationally recognized master degree in 4 years, rather than 5 using the local traditional route. At ITS, we decided to become a BTEC Centre since BTEC qualifications are recognized in more than 70 countries worldwide, and in 2013/2014, 2.58 million learners registered for BTEC programmes and other vocational qualifications. My personal story; when I was a young person, I did not take high school (secondary school) very seriously, I did not achieve grades good enough for me to get university admission. For my first career, I spent more than four years on active duty in the U.S. Marine Corps as an enlisted man. While on active duty in the military I had time to think about what I wanted to do with my life. When I left active duty as a veteran of the Vietnam War, I was given an allowance to pursue four years of education. I decided that I would use the allowance to pursue a bachelor degree. Not having the grades in high school to gain direct admission to university, I had to find an alternative route to reach my goal. I was able to take advantage of the Hawai’i Community College system to study for an associates degree and then, articulate to the University of Hawai’i Manoa to finish my B.A. in Psychology. Some years later, through continued studies, I was awarded a PhD from a UK university. Prior to the Marines, I was a construction worker. My experience as a young man made me a believer in nontraditional routes of higher education. The BTEC HND is an excellent alternative to direct entry to a traditional university programme.